Well, I made it to 100 books this year, helped immensely by a collection of art books and craft books. Trash to Treasure 8	 Leisure Arts, Inc.
Trash to Treasure 2	 Leisure Arts, Inc.
Another Antigone	 A.R. Gurney, Jr.
Paul Harvey’s For What It’s Worth	 edited by Paul Harvey, Jr. I didn’t read too much of real consequence this year; just a couple of Rudyard Kipling books. Also, in my defense in the run up to 100, one of the Kipling books was a collection with multiple books in it, and one of the Heinlein books I read this year was a collection of three shorter novels. Still, I count the number of books read. I also didn’t add in my own novel, which I’ve read once through in manuscript form and a half way in bound galley form. Watch for that next year, werd. If you’re interested in learning what I thought about each book on the list, check out the Book Reports category and keep scrolling. At nearly 30 feet long and 15 feet wide, the table and the hybrid game played on its surface — a combination of billiards and bowling that Steve calls “Knokkers” — are a culmination of an idea 25 years in the making. They need to put a statue of this visionary in downtown Milwaukee right next to the statue of Fonzie. This book is 25 books later into the series than Double Crossfire, and they really must have been churning them out by this time. Much has happened in the Executioner’s world. He’s no longer doing terrorists in Turkey, now he’s freelancing or something and he’s in Southeast Asia, rescuing POWs. It was what all the pulp guys were doing in that era. Sadly, the quality has declined greatly, and the character has changed. Now, instead of just killing bad guys, he’s also beating a Russian KGB official’s wife together with a chair leg as part of a trap. Not because she was going to squeal, but because she had to die. So it’s lost some of the essence of the character. The plot is movieish and a quick bunch of set pieces. You want to know what caliber of book this is? At the end, Mack Bolan saves the POWs, who are repatriated through a bureaucratic process. Bolan goes to meet his Khmer guide, Eng, an attractive woman who leads a band of resistance fighters. She looked up into his eyes. “Will you return to Bangkok with me?” she asked. Then Bolan read the look. It was longing, plain and simple. He realized now that she liked him more than just a friend. I got another later in the Executioner line here to read. I’ll probably hit it sometime next year. And, sadly, I’ll probably pick up more. On the one hand, with a series like this written by the shop writers, the quality is bound to be uneven to say the least. On the plus side, they can’t all be as bad as this, can they? Stay tuned in 2011 for answers. Growing up, I was always the scrawny, gangly, gawky nerd kind. I had glasses since I was five years old, I lacked some basic motor skills, and I didn’t have much musculature. So I only took the requisite gym classes and that was that. When I moved from my aunt’s basement in St. Charles, Missouri, to a mobile home in Jefferson County, I switched from a middle school that had gym in street clothes to a middle school that had a gym in gym clothes. That meant I had to acquire a pair of blue shorts and a lock for the locker. Coach Haug, the gym teacher, sold both, and for $5 I got this green-dialed lock. It served me in middle school, in high school, and then got dropped in a set of boxes and/or drawers until I returned to the gym. I’ve used it at the Mid-County YMCA in St. Louis County, the Edward Jones YMCA, Gold’s Gym, the Webster Groves YMCA, and now the Pat Jones YMCA. It’s guaranteed to be the only green lock in the locker room, which means I’ll never lose my daily locker. And I haven’t had to learn another combination in 25 years. The gym bag isn’t that old. As you can see by its side, it commemorates Super Bowl XXIV (24 in American). I didn’t get the bag from the pizza company. Christmas, 1990, was my freshman year in college, and I worked at a grocery store (Gold’s Shop Rite). The Golds were known for their great Christmas party, and 1990 was my first (and only). It was a snowy night in Milwaukee, as so many are in December. Patti C (“Does the C stand for “Cakes?” I’d asked when she started) drove Shawn and I the five blocks to hall the company rented. There, some dancing occurred, and an easily led young me performed the Worm for co-workers with the guys from Produce, who I thought were the coolest guys in the world when I was 18. When I was 19, I was in Produce, and I was right when I was younger. 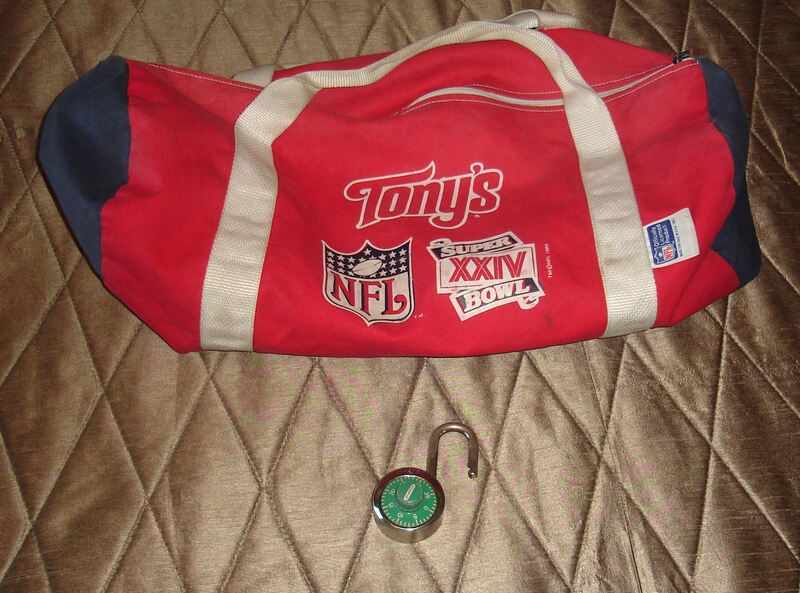 During college, I looped the handles of this bag through the back straps of my backpack and the two served as my luggage when I travelled by train between Milwaukee and Missouri. Then it sat in a closet for a couple of years, brought out occasionally to supplement my luggage for travel between Missouri and Milwaukee. Since I’ve gotten back to the gym, it’s born my clothes, the lock, gloves, and magazines exclusively. Both of these articles are in good shape, as well as one could expect with fairly frequent use in infrequent bursts of fitness diligence on my part. They’ve lasted me 25 and 20 years respectively; there’s really no reason why they won’t last another 20 or so. Robert Heinlein is like Ayn Rand with ray guns. Okay, I said that to cheese off Robert Heinlein and Ayn Rand fans, but I think there’s probably some overlap. Heinlein works some political views into his books with paragraph-long statements of philosophy. A lot of authors do this–you can review the list of contemporary crime fiction authors who have cheesed me off with their flippant anti-conservative remarks–but the difference with Heinlein is that you get some building of an argument in those paragraphs, a defense and explanation of the viewpoint instead of just a glib insult. I like it better. Also, it tracks with my viewpoint. This book collects 800 pages of short stories written over decades that make up the Future History timeline (most of the material; Wikipedia says there are others, and I think Time Enough For Love fits into the story arc). The Future History covers several hundred years, from Earth’s movement to the Road City model (where moving sidewalks built to superhighway size dictate commerce and growth) to the drive to put man on the Moon, the resulting interplanetary colonization and imperialism, the revolts, the rise of a theocracy in America, the revolution against the theocracy, and then the treatment of a subrace of long-lived humans when they are discovered. The stories themselves are forty to sixty years old, so the space race and human development haven’t proceeded in the fashion depicted, but given that we haven’t gotten far into space yet, much of it could still come truish. For example, Heinlein doesn’t see moon travel as a government program (as it was), but a private endeavor (as it will be). So you have to overlook places where the author projects his expectations into the future that is actually our past and present (and future) that don’t follow along the lines of actual development. If you can get past that, you have a lot of exciting and engaging classic science fiction available to you. Mostly short stories, but some long novellas and short novels in the mix kept me coming back. I was feeling pretty cocky after Thanksgiving when I’d read 95 books or so, so I thought I’d try to run through this in my drive to 100 books. This took me a month to read, but I’m still in good shape. And Heinlein is good fun. The stories are not hyper-obsessed with science like you get in more modern science fiction along the lines of The Forge of God or the works of Larry Niven, so the focus on story keeps one reading. I’ve got more Heinlein on my to-read shelves, and that’s a good place to be. It must be Year of the Early 1980s Good Morning, America Contributor here at MfBJN. In November, I reported on a book by Erma Bombeck, and now I’ve run through this collection by Mary Ellen Pinkham. Like the Bombeck book, this book belonged to my mother, although I cannot imagine she used it much as cleaning and cooking were not her bailiwicks. This book is a bit of a time capsule to that middle-of-the-century period where housewives looked for tips and tricks to keep their homes clean and their tables laden within a budget. Personally, I wonder how much the world has changed compared to how much my status has changed when I look at these books. On the one hand, I have moved upward from the housing projects to a nice rural retreat in the 30 years since this book was published. On the other hand, technology and the culture have changed to some degree changed. The first chapter, for example, deals an awful lot with gravy and how to thicken, thin, extend, and otherwise deal with its defects. How many people under the age of 50 cook with gravy in the 21st century? Honestly, I don’t know. At any rate, it’s a collection of grouped hints, as the title indicates. I don’t think I’ll take too many things away from it as the price of cleaning products has fallen to the point that it’s less expensive to buy a cleaner off the shelf for a dedicated task than it is to buy the precursors listed in the book. Maybe I’m just to bourgeois to think so. I did see a couple of hints (toothpicks in screw holes to tighten the screws and toothpaste in nail holes to cover them before you paint) that my mother passed onto me. I don’t think she got them from the book; I’d wager they were such common knowledge that even my mother knew them. I still use the toothpicks thing, although I can afford filler now for holes before I have my painter come in and paint things in the shade my interior decorator designs for my feng shui. So maybe hints remain relevant for some people beneath me. I do see Heloise still runs in the local rag, after all, but my daily stock reports are not. Merry Christmas. Now I Declare War On It. First of all, Merry Christmas to my Christian readers. And happy holidays to everyone else. Now, I know I’ve made fun of organizations that use “Happy Holidays” instead of Merry Christmas (well, just this Catholic university). I know it’s the time for getting into high dudgeon about ignoring the significance of the Christian holiday at a time when Christianity is under siege in the country and the world. However, before one gets all a-bluster about not saying or not being excited about receiving a “Merry Christmas,” consider why one says that at all. Of course, it’s not just a timely greeting of the day. It carries additional significance. For many, it’s a reminder of the birth of Christ, the redemption of man, and the fulfillment of a promise from Yahweh. That is what the day means to Christians, and it has a very particular significance. It also celebrates a festival of sorts, some family time, good will, and the more secular emanations of the event. Peace on earth, goodwill to men and so on. So: consider what you mean when you say Merry Christmas or Happy Holidays. If you say “Merry Christmas,” to another Christian, of course it’s a greeting and a reminder of shared values and whatnot. If you say “Merry Christmas” to someone who is not a Christian, it’s a lot like saying, “Happy Independence Day” to a Canadian or having a Canadian say “Happy Victoria Day” to you. You might as well say “Merry Saturday.” Merry Christmas lacks the special significance textually to the non-Christian recipient. If you say it to share the general goodwill of the season, as you probably do, there’s nothing wrong with it. However, “Happy Holidays” captures this spirit, too, and organizations and commercial enterprises that deal with more than just Christians might not so much want to throw the Christian holiday to the lions as to share the goodwill emanating from the holiday to all. Of course, if your purpose in saying “Merry Christmas” is to greet fellow Christians only and to proselytize to the non-believers at the same time, to throw in their face their heathen status, and to serve as the single calling to God after which the non-believers can burn in Hell for believing differently, I can see why it’s very important that everything in Christendom bear those words in that order. Of course, it’s most likely not the intention. Instead, most who say “Merry Christmas” are the former, sharing general goodwill and fellowship. So what’s the difference, then, between saying, “Happy holidays” versus “Merry Christmas”? Too many Christians think that their religion is under assault from secularists who want to take the lower case t out of Christmas because it looks like a cross and turn the holiday into Chrismas. Or something. They’re afraid that inclusiveness in cheer and well-wishing is going to strip their meaning from the holiday. Crikey, the generic tidings of a marketing team or a right-thinking fellow can’t diminish the birth of Christ and your celebration of it that much, can they? I should hope not. Besides, the person who says it to you probably means pretty much the same thing as you do except he or she is expressing it as he or she can. On the flip side, of course, anyone who gets wished a Merry Christmas who gets insulted because he, she, or it is not a Christian should take the tiding in the spirit in which it was probably offered and spare the self-righteous indignation at the ignorance of the Christer who offers it. For Pete’s sake, hail the all powerful Pete, All-Doing and All-Seeing immortal Pete, it’s not a direct attack on the fact that you’re different from the speaker. Punch the END button before your attorney answers and respond “Merry Christmas” or say “Happy Holidays” instead, or “May Pete’s Sweat of Opulence fall upon you” and let it go. The dangers arising from the Marxist, cult-of-personality rule of Venezuelan strongman Hugo Chavez are many. These weapons are only the largest and most destructive purchased or finagled by Chavez. He has also purchased an enormous number of Russian assault rifles — the real thing, fully automatic military rifles, not the non-existent “assault weapons” of gun control imaginations and press releases — and related weapons and ammunition. Well, looks like history is back from its hudna. Hopefully, someone at my children’s school will remember enough to teach them to duck and cover. Here at the old Nogglestead, we have two children that we’d like to educate so that they grow up to be good conservatives like us. Ha! some would say, but probably not those who read this blog, You mean you want to teach them all sorts of unscientific things so that they cannot see the logical, reasonable, scientific Progress of Man and his evolution into the highest form of life, the faceless vassal of the all-powerful State! Well, part of the charge is true. Here at Nogglestead, we use texts that teach scientific untruths to our children. 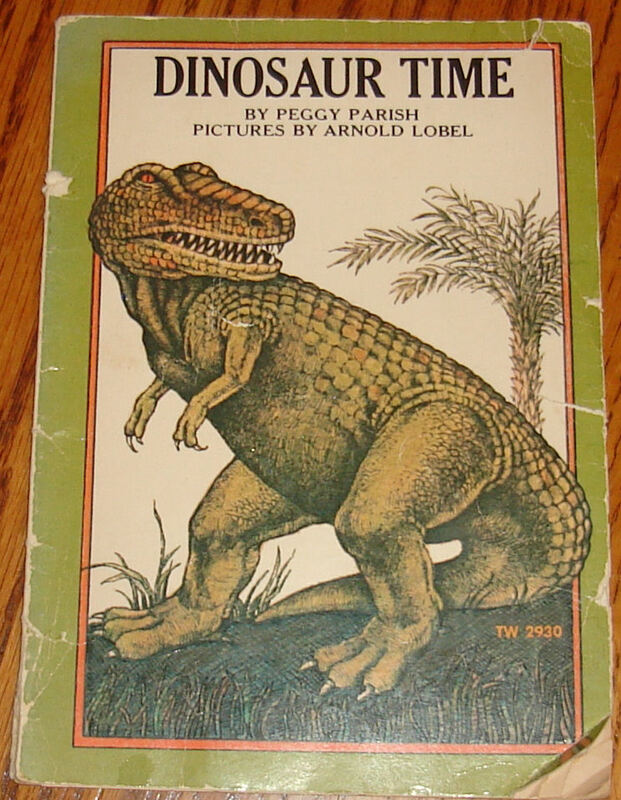 Dinosaur Time, written by the author of pseudo-rational Clues in the Woods and related series Peggy Parrish and illustrated by the author of the rational-for-having-an- anthropomorphic-mouse-antagonist Mouse Soup Arnold Lobel. As a side note, this book is the source of one of my first remembered nightmares when I was in elementary school. True story: I dreamed that I and Chris something, who lived on the corner of 39th and Florist in an actual house and not a housing project apartment, were on some sort of raised dais with Greek columns all around and an altar or lectern or table. On it rested this book. Chris goes up the steps to it and looks at it and expresses impressedness and asks if I want to look at it, too. I lie on the ground with my hands behind my head and decline. At this point, a Tyrannosaurus head appears in the clouds above and says, “Don’t you want to learn about us?” and I scream and awaken. 30+ years later, I remember it vividly. Behold the backward thinking. 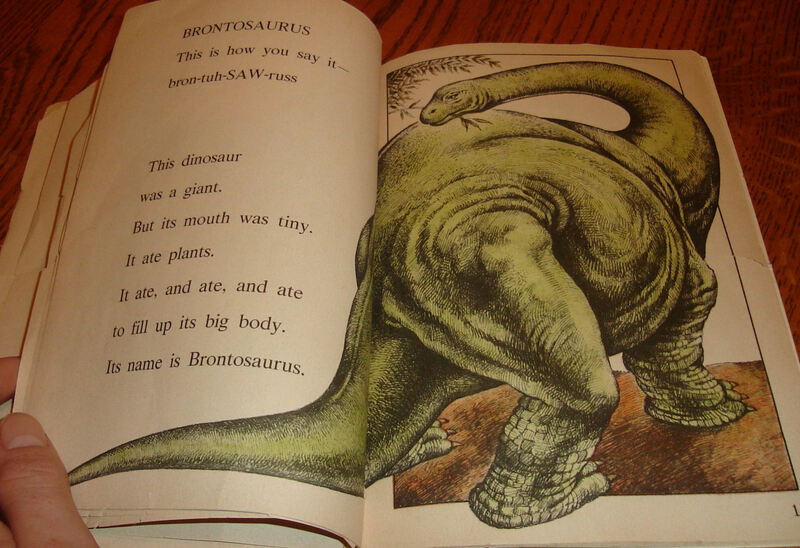 As anyone who is up on paleontology discovered since Generation X came up through the minor leagues knows, the Brontosaurus does not exist. It is the Apatosaurus now. 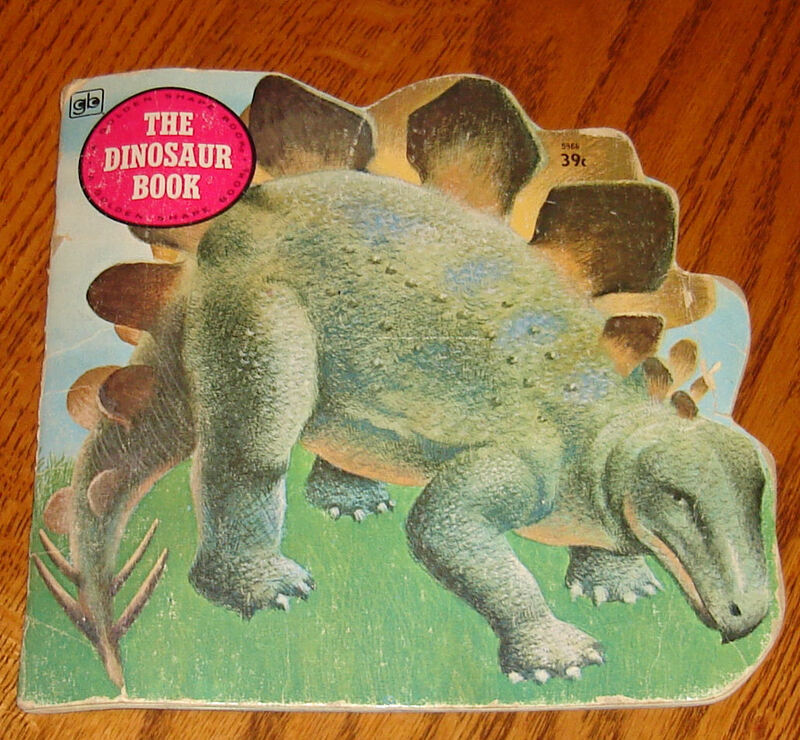 The Dinosaur Book. A Golden Shape book, this verily is also a backward text even if I don’t have any particular nightmares to report about it. 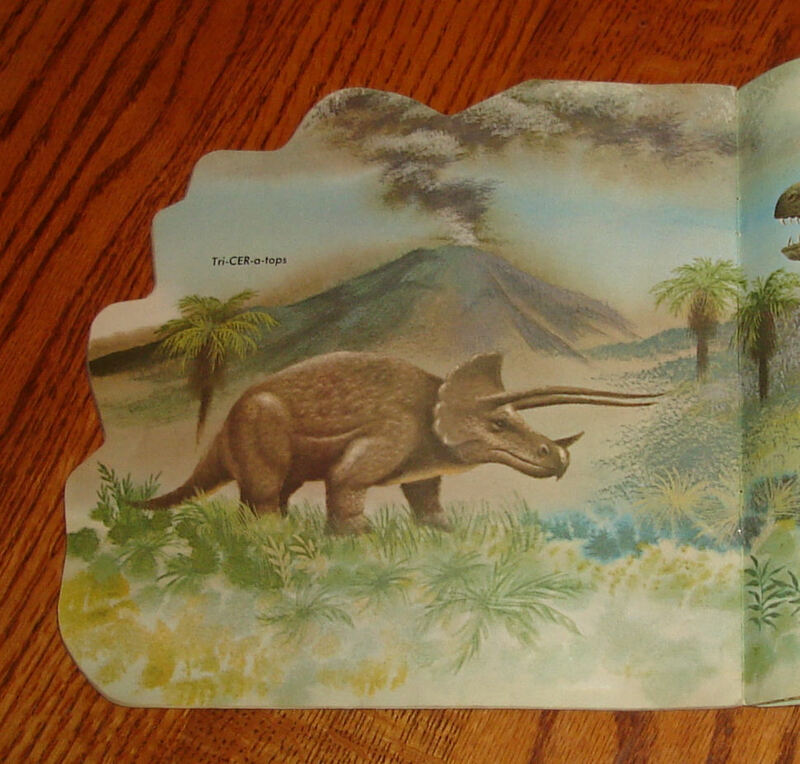 This book depicts a triceratops as though the three-horned lizard existed as its own independent kind of dinosaur. Not so fast. Recently, paleontologists have determined that the triceratops is just a juvenile torosaurus. That is, it is not a separate species, and scientists will henceforth stop talking about the triceratops, and those of us who did not read Journal of Vertebrate Paleontology are just troglodytes who oppose the government meting out of radiology. 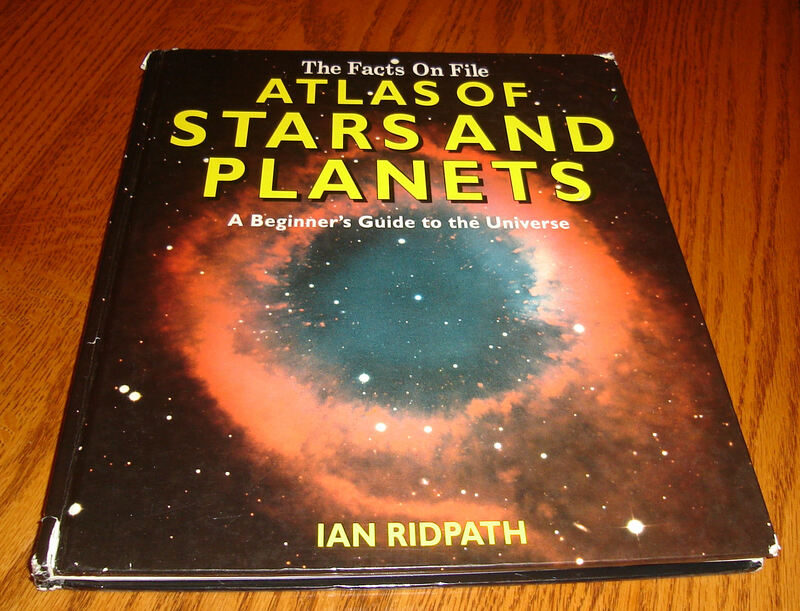 Facts on File Atlas of Stars and Planets by Ian Ridpath. You would think that the Noggles would teach modern truths about the cosmos, such as the Earth revolves around the sun. After all, Noggle himself reads science fiction. Surely he would not teach falsity to his children here. 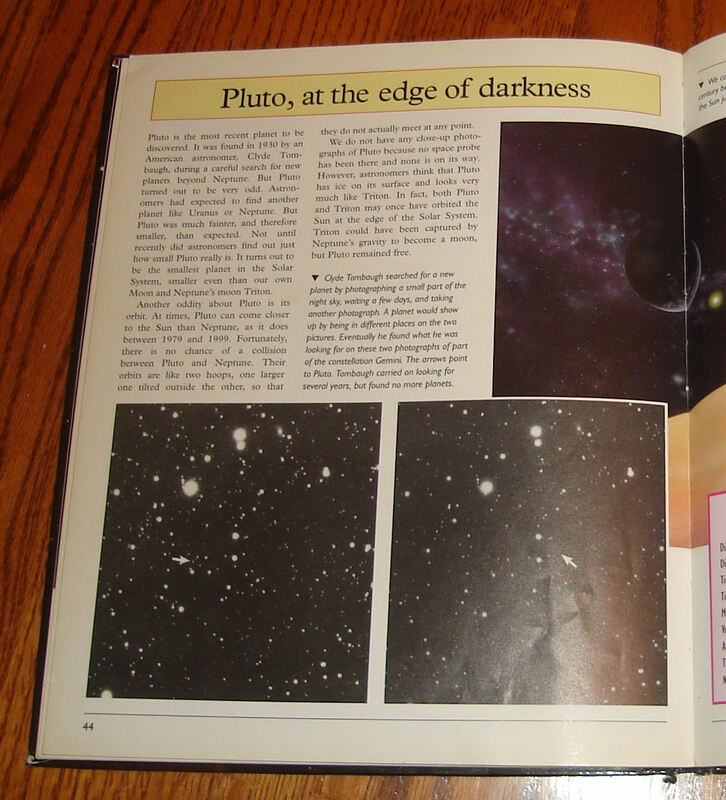 As you know, semantically speaking, the astronomers’ consortium determined the definition of planet no longer fits Pluto. So, after a hundred years, it’s off the list. And Mercury is on notice. The Noggles are therefore anti-science Republicans. Granted, these particulars of science represent a portion of the angels-on-the-head-of-a-pin branches of science and semantics. Pluto is there, the bones were there, but every other part of the controversy and the changes represents a change in an inference or a definition on the part of scientists. And although they would prefer you simply bow to their new definitions, the scientists really aren’t changing facts at all. So pardon me if I’m just as skeptical of scientists as I am of everyone else. Reality is as reality is, but reality as revealed by the scientists is still reality filtered through chosen acolytes. don’t you know you can count us all out? Actually, it’s a Christmas redirect. Here’s a link to a short story entitled “Die Hard MDCXCII: Die Really, Really, REALLY Hard” that I originally posted 6 years ago, which is approximately 49 in Internet years. The story is from 1990 and represents some obvious wish fulfillment. But the guys at the grocery store where I worked and that is depicted therein thought it was a hoot. Hopefully, you’ll be slightly amused in places, too. The 34-mile, 85-minute morning run left Pacific at 6:05 a.m. and stopped 19 times at places like Jedburg and Barretts Station, in downtown Kirkwood, at the Webster Park and Tuxedo Park stations in Webster Groves and Tower Grove station on Vandeventer Avenue. Outbound trains did the same in reverse. Dedicated commuters enjoyed the ride with endless card games. The Rattlers threw parties with the slightest provocation. Drinks all around, of course. By 1961, with plans under way for Interstate 44, the one-way fares topping at $1.10 paid less than half of the $68,000 annual operating cost. And then that blasted highway came along and gave people the freedom to travel to their homes when they wanted to, and without losing money! On rail lines built by private companies and in trains run by private companies. You know what would return us to those swinging days? Government spending! Except then they would run empty trains until such time as the government runs up the cost of gasoline. Except that when the cost of energy goes up that high, there won’t be many commuters. Gah, being an economic central planner is hard. Fortunately for the St. Louis Post-Dispatch, being a cheerleader for central planning is still easy. UPDATE: Thanks for the link, Ms. K.. Hey, if you’re in IT, check out my blog QA Hates You. If you’re a Missourian or a Tea Party kinda person, you might enjoy 24th State, a Missouri political blog to which I contribute. First, the Earth does not have intention, no matter how fervently its worshipers want to anthropomorphize it. Seriously, what the hell kind of “journalist” writes like that, where the planet is at odds with humans? Sorry, I lost my head there. This is an AP wire story. No news was intended nor implied. Secondly, the deadliest year in a generation? A generation of what, exactly, that has been born in the six years since the Indonesian tsunami killed almost a quarter million people on one day alone. Given the inclinations of these writers, perhaps they’re thinking of more than a generation of Toyota Priuses. How uncritical do you have to be to fall for this kind of “reporting”? What kind of gull do you have to be to write it? Could the Minnesota Viqueens be thinking of moving west? Snow does not make roofs collapse. Google it! 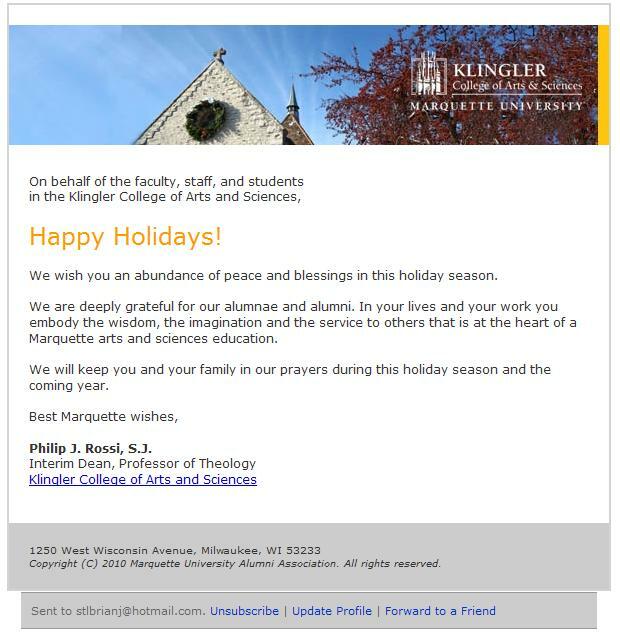 You’ll notice first, as I did, that Marquette University, a Catholic institution, sends out greetings for the holidays, not for Christmas. I guess fundraising from nonbelievers trumps celebrating the birth of Christ, the ultimate basis for the existence of Marquette University (but no longer the ongoing reason for its existence). Secondly, you might note that Marquette has sold the naming rights to its college of arts and sciences. I have to say I’m glad that doesn’t appear on my diploma. I loved this book. It’s a collection of stories about growing up just southeast of Springfield, Missouri, in the 1930s. The author moves with his family to a small homestead called Bethany Homestead with his family of 7. His father’s a Lutheran minister and a frequent missionary to Africa who really wants to return, but he serves as pastor to a number of churches in the United States. This leaves the wife and her children (10 by the time the book ends) on the little farm, which has some crops and a large orchard not to mention some cattle to tend to. The second oldest boy, John takes an active role in the household. It’s a strange other country, the past. While some of the landmarks are familiar, the culture is different. For example, the author took a year off between finishing school and deciding whether to pursue further education. Not between high school and college, not between his undergrad years and going onto medical school. Between 8th grade and high school. During this year, his father is preaching in Nebraska and his brother is in high school already, so the 13 year old boy is effectively the man of the house, working outside the home for some extra income and taking care of chores and helping his mother tend the 8 siblings at home. 13! He also recounts travelling to the upper peninsula of Michigan to visit his father (who’s preaching afar again) and, instead of riding in a single Packard laden with his 9 siblings and mother, stays over an extra couple of days in Michigan and hitchhikes home. I wondered if this sort of collection of stories would fly were I or a peer try to write it about our youths in the 1970s and 1980s, whether they would be interesting enough to draw any attention from seekers of esoterica 50 years from now. You know what? They just might. Some of my stories sound outlandish among my cohort now, only 30 years beyond their occurence. Perhaps in another 30 years they will be exotic enjoyments for readers. If anyone reads in 2040. At any rate, I liked the book so much I’ll keep my eyes out for the others written by Hult and his immediate family. Also, last night, I returned to the used book store where I bought this book and bought six other memoirs in the same vein from different authors from the Ozarks. On the heels of World AIDS Day comes a stunning medical breakthrough: Doctors believe an HIV-positive man who underwent a stem cell transplant has been cured as a result of the procedure. The breakthrough appears to be that Dr. Hütter, a soft-spoken hematologist who isn’t an AIDS specialist, deliberately replaced the patient’s bone marrow cells with those from a donor who has a naturally occurring genetic mutation that renders his cells immune to almost all strains of HIV, the virus that causes AIDS. Those stem cells were adult stem cells, not embryonic stem cells. Take a look at the comment sections where people are celebrating the publication of this old finding and are also doing their best to bash George W. Bush and other people who oppose funding for or who oppose actual embryonic stem cell research. We need to amplify and clarify the source of these stem cells and this treatment to educate the public about this efficacy of adult stem cell therapies. Otherwise, parts of the public will remain ignorant and might be encouraged to pursue policies that their countrymen find morally abhorrent to fund research of unproven avenues of medicine. UPDATE: Welcome, Instapundit readers! If you’re in IT, you might want to check out my tech blog QA Hates You. If you’re from Missouri, you might want to check out 24th State, a blog about Missouri politics to which I contribute. When companies ship jobs and functions overseas, they’re bad guys. When school administrators send some of their core responsibilities, in this case curriculum development, they increase quality and prestige. With the bonus of spending more money instead of trying to save it.